We offer a bespoke and comprehensive service to our high net worth clients. If you have a high value home and contents then you need to know that your insurance is properly arranged and with the claims service you expect. You will not expect to deal with a faceless, online organisation. You will want to speak with informed experts, able to discuss the options and give you advice on the best way to arrange cover for your individual circumstances. 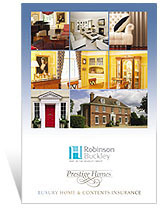 Robinson Buckley work with the best insurers in this specialist area, to give you a cover tailored to your individual requirements. We can help with appraisals and valuations to ensure that your buildings, contents and valuables are correctly stated. We also work with specialists for fine arts, antiques, watches, clocks and other collectables who can provide valuations, restoration and repair work. For a quotation or cover please telephone to speak to one of our advisers. Alternatively, if you find it more convenient, please complete our proposal form on the tab above.